22 year old Timothy Graves. Photo courtesy of Kristy Novicki. 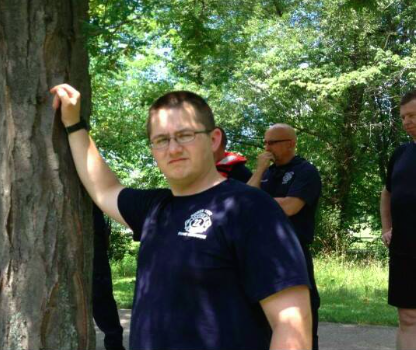 Timothy Graves — a current EMT with Healthlink EMS out of Taylor, MI — has been missing since Sunday evening. Graves’ shift ended at 10 p.m. June 28 at the Healthlink offices in Taylor and since then, no one has seen him or has had contact with him. As of Tuesday evening, according to multiple Facebook reports, Graves’ car was found at a rest stop near Bowling Green, Ohio. However, there was no sign of the 22 year old. Graves drives a dark green 1995 Saturn 4 door sedan license plate number BKW8029. A resident of Belleville and a former Huron Township Fire Fighter, Graves is 5 foot 6 inches tall, has dark hair, wears glasses and was last seen wearing a Healthlink EMT uniform. If you have seen or heard from Graves, please call your local police department. This entry was posted in Front Page News on July 1, 2015 by Scott Bolthouse.